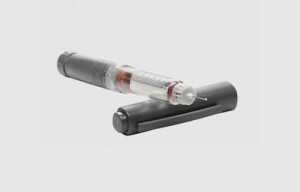 With single-use drug-delivery devices, you only have one shot to get it right in an emergency situation, says Josh Blackmore, Global Healthcare Manager at compounder RTP Co. (Winona, MN). To help medical device designers engineer the best possible plastic-on-plastic applications for these types of medical products, RTP has published an informative white paper: “Low-Friction Plastic Technology for Single-Use Drug-Delivery Devices.” It presented the paper to the media at the recent Medical Design & Manufacturing (MD&M) East event in New York, NY, last week. In particular, the white paper details a new friction test developed by RTP that enables a comparison of plastic-against-plastic friction behavior that occurs at initial start up and the core data point—Glide Factor SM—defined as the lowest and most consistently achievable static coefficient of friction (COF) value with the least amount of difference between static and dynamic COF. The paper also includes a series of tests that compare the friction behavior of certain polymers and internal lubricants for use in this application. The new friction test is the first of its kind that applies to single-use devices that rely either on a spring force mechanism or human actuation, according to Blackmore. Many devices use a secondary external lubricant, often silicone, to achieve a quiet and smooth operation. This adds cost and requires additional quality inspections. It also exposes the patient to lubricants and can drive increased requirements for drug interaction and leach testing. By embedding the lubricant within the plastic, patient exposure is eliminated, dispersion of the lubricant is improved and production and testing costs are reduced, according to RTP.